Liangpi (simplified Chinese: 凉皮; traditional Chinese: 涼皮; pinyin: liángpí; literally: "cold skin") is a noodle-like Chinese dish made from wheat or rice flour. It is a specialty dish originating from the Chinese province of Shaanxi, but has now spread to many other places in China, in particular the northern and central regions. Although liangpi is served cold, they are served in every season, including winter. 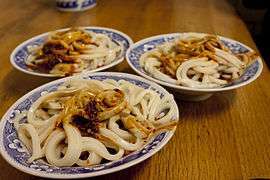 New York Times' Julia Moskin describes liangpi as served at Xi'an Famous Foods as "a dish of cold noodles in a sauce that hits every possible flavor category (sweet, tangy, savory, herbal, nutty and dozens of others)." First, wheat or rice flour is turned into a soft dough by adding water and a little bit of salt. Then, the dough is put in a bowl, water is added and the dough has to be "rinsed" until the water is saturated with starch from the dough, turning into a muddy white color. The remainder of the dough is now removed, and the bowl is left to rest overnight at a cool place to allow the dissolved starch to precipitate. The following day, there will be a kind of starch-paste on the bottom of the bowl, with a more or less clear liquid on top, which has to be discarded. Once the liquid has been removed, a small amount of the paste can then be poured into a flat plate or tray, and spread evenly in a thin layer. The whole plate is placed into a large pot full of boiling water, where it is steamed for a couple of minutes, and the resulting "pancake" cut into long pieces vaguely resembling noodles. Hanzhong Liangpi (simplified Chinese: 汉中凉皮; traditional Chinese: 漢中涼皮; pinyin: Hànzhōng liángpí) or Hanzhong Mianpi (simplified Chinese: 汉中面皮; traditional Chinese: 漢中面皮; pinyin: Hànzhōng miànpí), named for the city of Hanzhong in southwestern Shaanxi, are steamed liangpi with garlic and hot chili oil. Majiang Liangpi (simplified Chinese: 麻酱凉皮; traditional Chinese: 麻醬涼皮; pinyin: Májiàng liángpí) are liangpi garnished with julienned cucumber and a sauce made of salt, vinegar, hot chili oil and especially black sesame paste, for which it is named (simplified Chinese: 麻酱; traditional Chinese: 麻醬; pinyin: Májiàng). 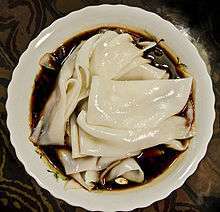 Shan Xin Gan Mianpi is another type of Liangpi, which tastes a bit firmer and looks darker in color compared to other Liangpi. It is always served with Mianjin (solidified gluten), vinegar, chilli oil, salt, mashed garlic in water and bean sprout. ↑ "凉皮", Baidu, 28 August 2008. ↑ Moskin, Julia (30 July 2008). "Let the Meals Begin: Finding Beijing in Flushing". The New York Times. ↑ "凉皮——详细制作过程教你做陕西风味小吃", meishichina.com, 23 July 2008. ↑ "各具特色的陕西凉皮", meishichina.com, 6 March 2005. ↑ Goldberg, Lina (22 February 2013). "Asia's 10 greatest street food cities". CNN Travel. Retrieved 24 February 2013.